By now our crew was in a sweet groove. 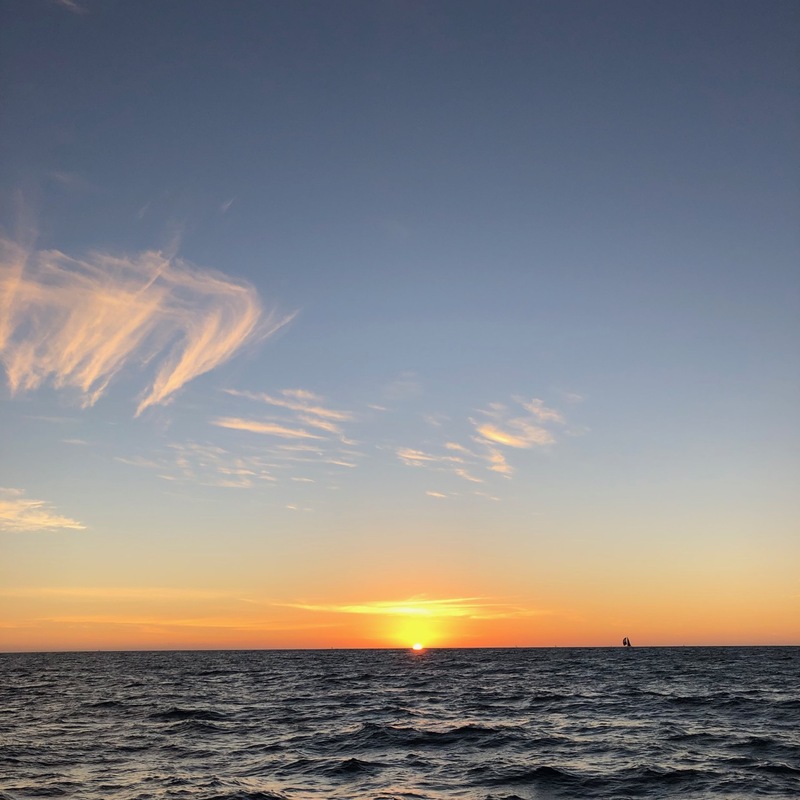 We had a routine with shifts, and the second leg was just one overnight rather than two. Gabe had noticed that while the schedule said we each had a three hour shift at night, James and I also had a quiet agreement that we wouldn't leave Gabe alone. 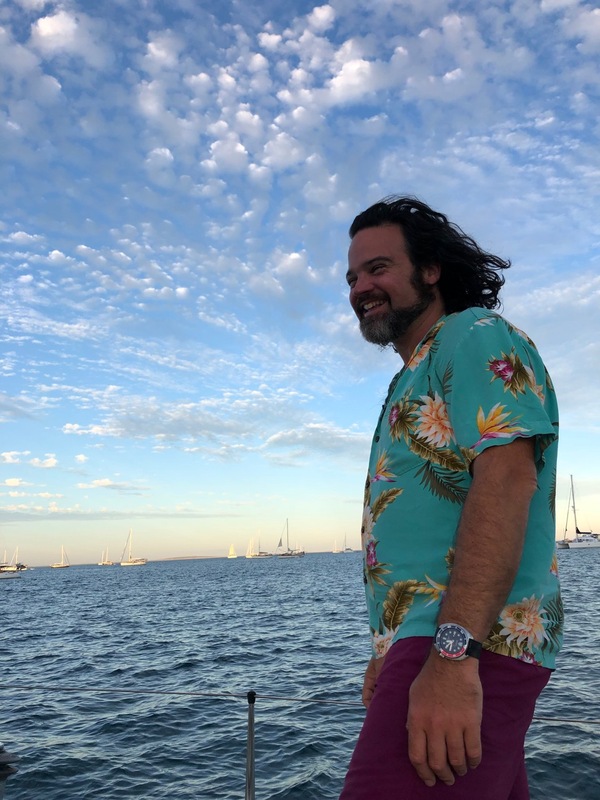 Gabe had never been sailing when we invited him, and he doesn't swim. When I suggested he could simply float if needed, he said with calm clarity "Nope, I'm a sinker." Nevertheless, he immediately agreed to come with us. We knew he was serious when he told us that his wife Paige had gifted him a pillowcase that had a photo of her and their dog Luna on it. Gabe signed up for a weekend learning to crew workshop at OCSC, where James and I studied. Our friend Dan, who joined us for our passage from Montery to Morro Bay, took Gabe and Paige out on the San Francisco Bay aboard his boat (which was our first boat). Gabe practiced knots, shopped carefully for gear, prepared a whole hard drive of music for us, and generally knocked it out of the park before he even arrived. Onboard, once he noticed that he always had company for his night shift, he returned the favor, staying up through big portions of me and James' night watches to keep us company. One of the things I admire most about Gabe is his genuine interest in other people and his ability to ask wonderful questions. He inspires incredible conversations in all settings, and when you've got several long nights to sit in the dark... well, Gabe now knows more about James and I than most folks, I'd say. So we had our formal schedule of shifts, but we also had the informal accommodations and gifts we were giving one another. The days were long and quiet; we napped a lot. You can feel the chill at sunset. As I mentioned in Leg One, once we got out of each bay onto the water, boats would naturally spread out. 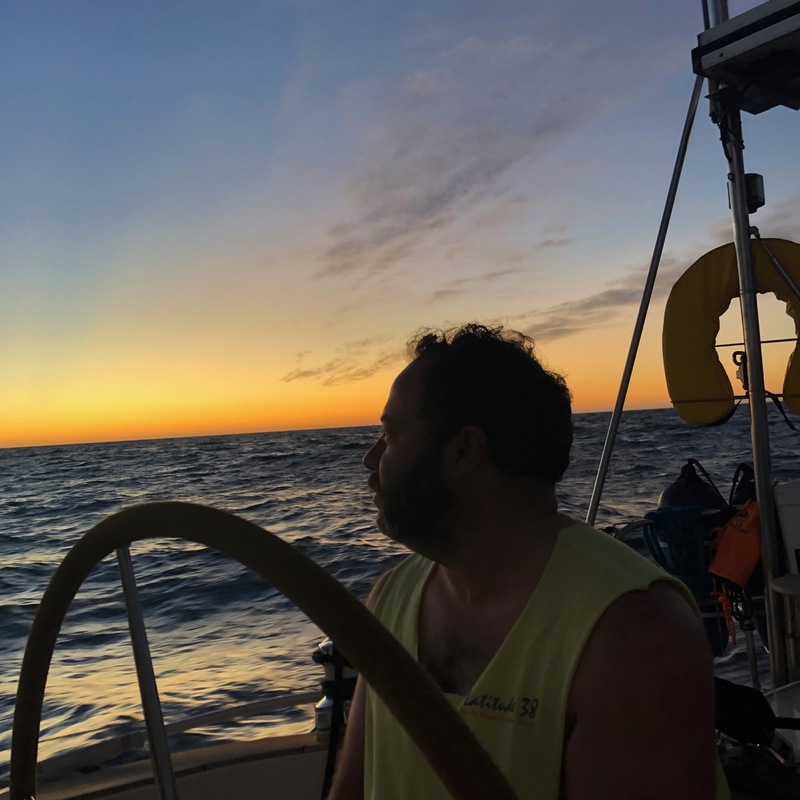 There was just about zero wind on this leg, though, and all the boats were motoring, so the fleet ended up more closely spread along the line between our destinations on this leg. 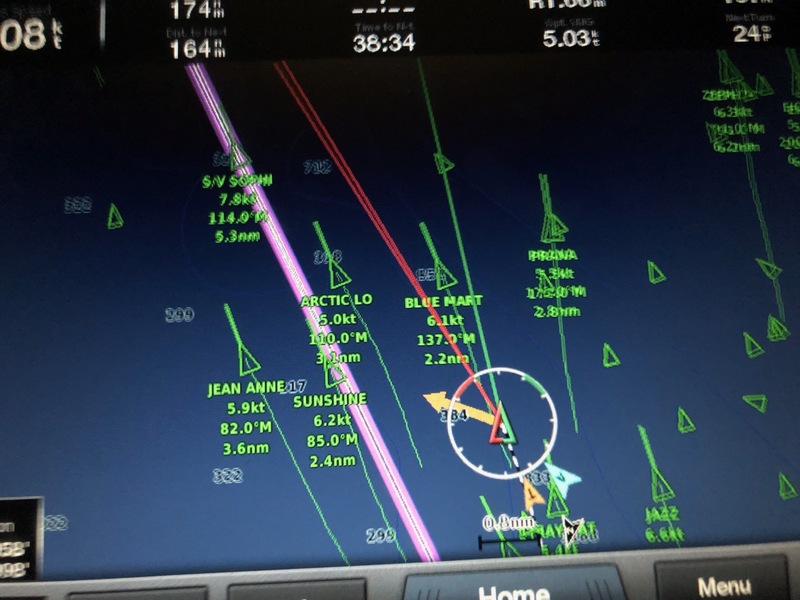 Here is a (sorry, not great) shot of our chart plotter on the overnight. At first glance, it looks like we are in a close nest of boats, but the scale of the map is at .8 nautical miles. 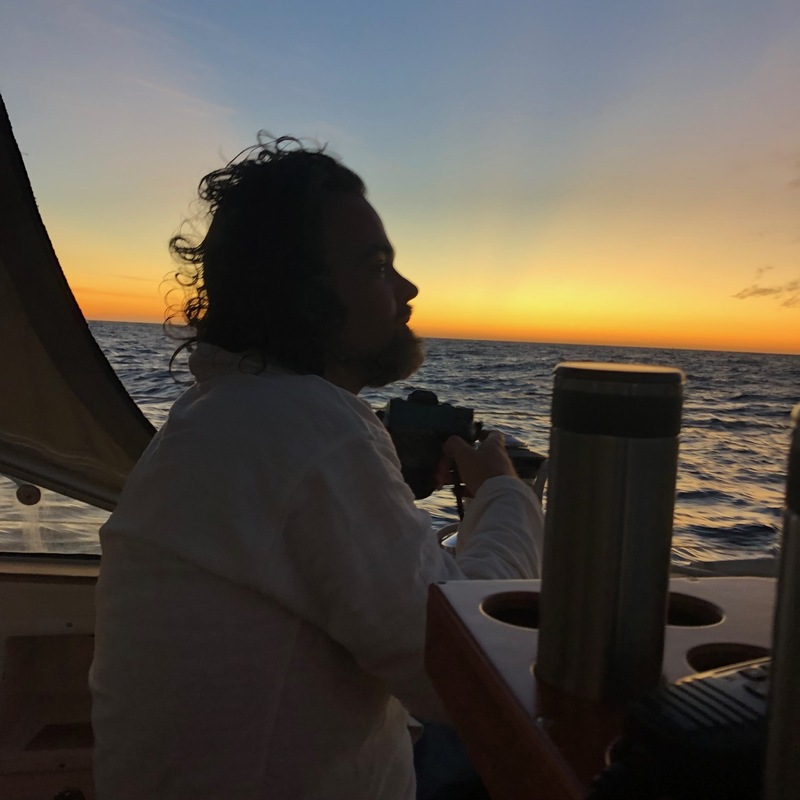 We could see a distant ring of lights at night from the other boats, but half a mile was a close encounter; it was a fascinating mixture of solitude and togetherness. Generally it felt polite to stay a mile or two away from others. The next day, the water was like glass! 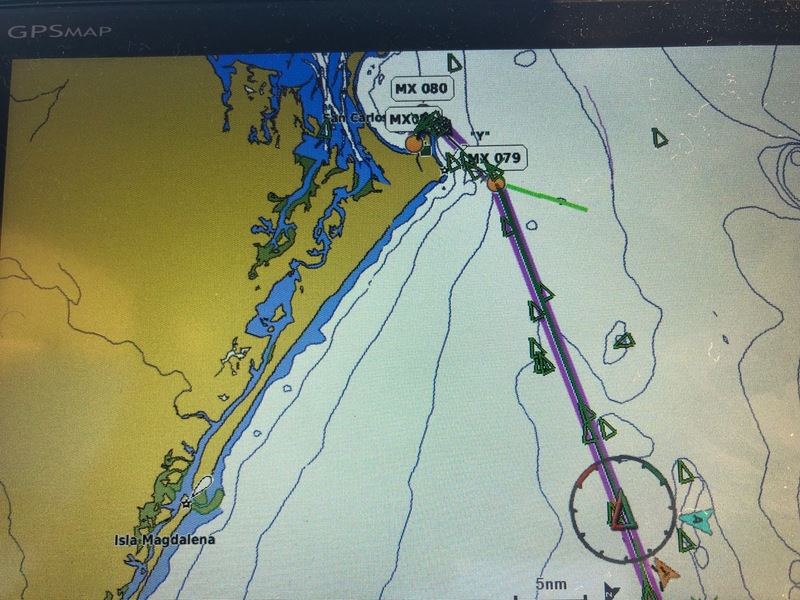 At one point there was a boat crossing the standard path perpendicularly; we knew from the name on our AIS that it was a Ha-Ha boat, so we hailed them by VHF to see if they were okay. "We're great!" they replied, "Taking turns hanging off the boat by the docklines and swimming with the dolphins!" The water was so still they just jumped in, though they were careful to use their lines to stay close to the boat. 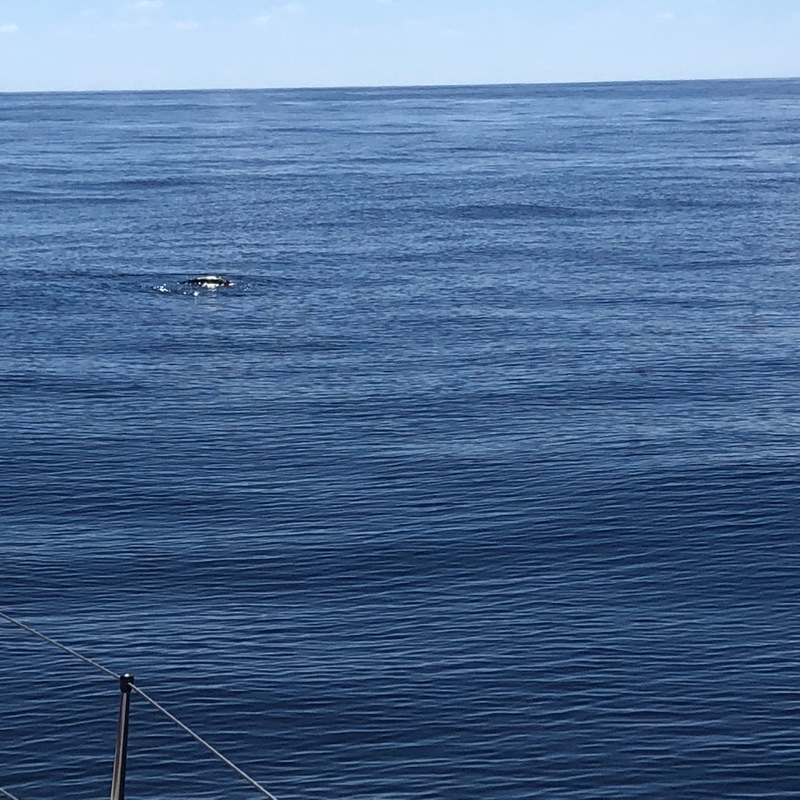 I was particularly excited when a nearby (2 nautical miles) boat hailed us to let us know that they had seen a couple of sea turtles. 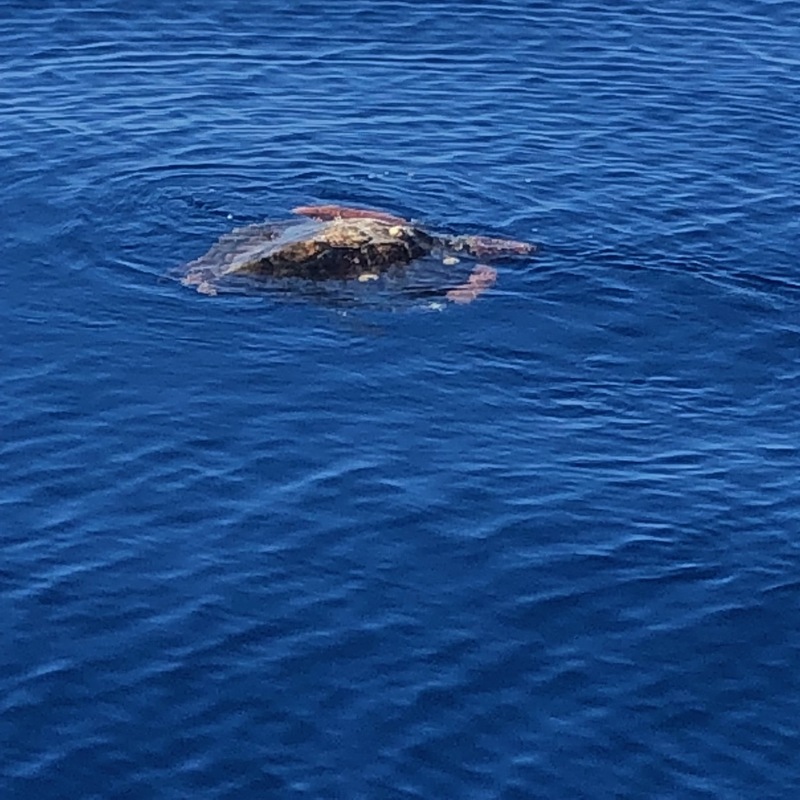 I had never seen a sea turtle. And then I did! James was napping down in the saloon and Gabe was lounging in the cockpit while I was on watch. I shouted SEA TURTLE! Someone else said they had seen three! I was so excited. I saw two! Three! FOUR! 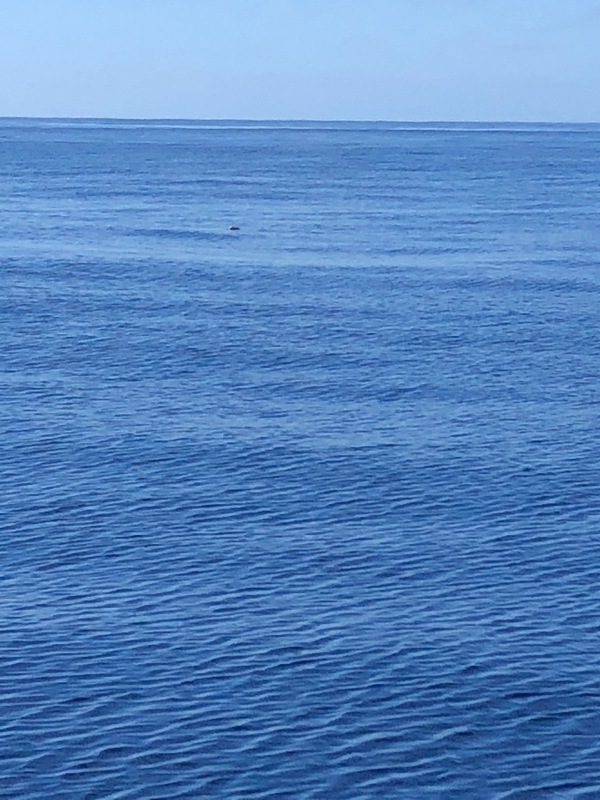 In the glassy conditions, it was easy to spot the turtles, even at a decent distance. before they would startle and turtle-dash away. A turtle doesn't dash very quickly, though, so I spent a couple of hours standing on the cockpit seats spotting sea turtles, hand-steering around them, and counting them all with great glee. Bless Gabe and his patience. At forty three I quit and went downstairs to do the lunch dishes. 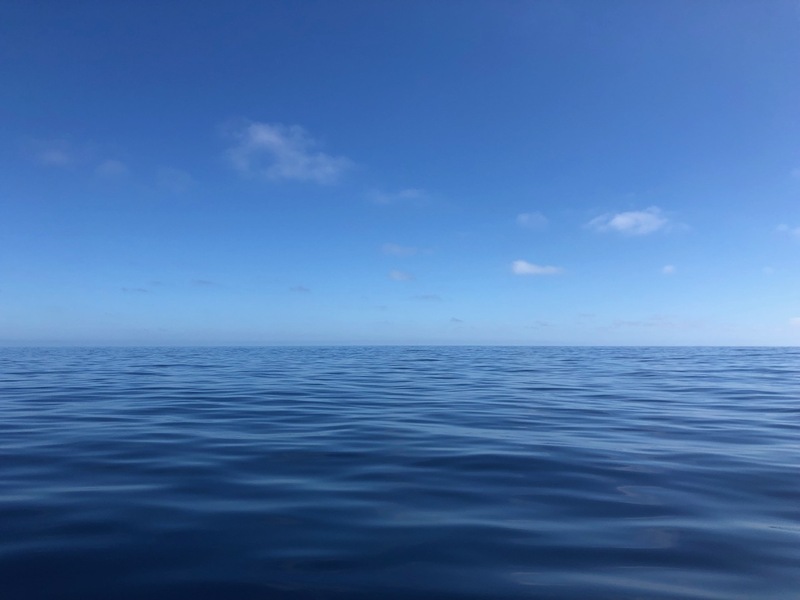 Finally, we the approach to Bahia Santa Maria was underway. We arrived just before the sun set, ate dinner, and crashed out early. We had been frugal with our water usage thus far. We were 2/3 of the way into our trip, and we had yet to tap into the second water tank. ('joice has about 108 gallons of fresh water capacity in two tanks.) We had been dutifully applying sunscreen daily-- none of us got a substantial sunburn the whole trip! We were doing sponge baths (with the amazing Water Wipes, which are baby wipes that are just water with a bit of grapefruit seed extract. I have a CASE of them stashed aboard. ), but really, nothing beats a shower. We felt GROSS. 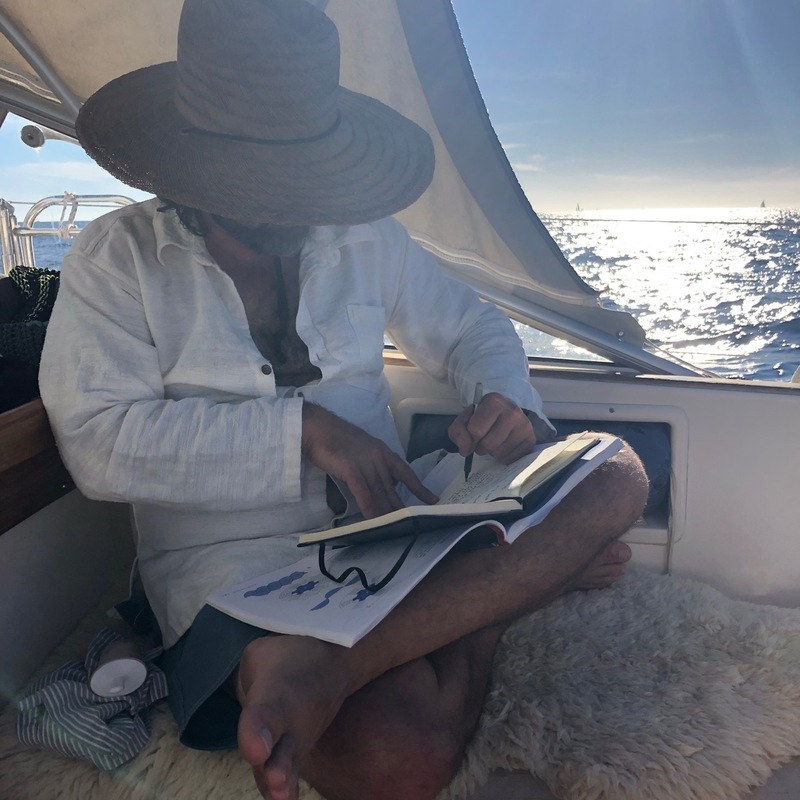 As we approached Bahia Santa Maria, I announced that I, as the XO and provisioner, was formally announcing that THERE WOULD BE SHOWERS. We woke up in the morning and prepared to make use of 'joice's stern hot water tap for the first time. What is a stern hot water tap? This means that 1. Rejoice has a hot water tank. Water is heated by the engine when we use it, and can be heated by a hot water heater when we are at dock and have AC power. 2. There is an outlet for hot water at the rear of the boat that we can plug a little hose with a spray head into. 'joice has a sugar scoop, which is a set of steps down the rear of the boat to the water. 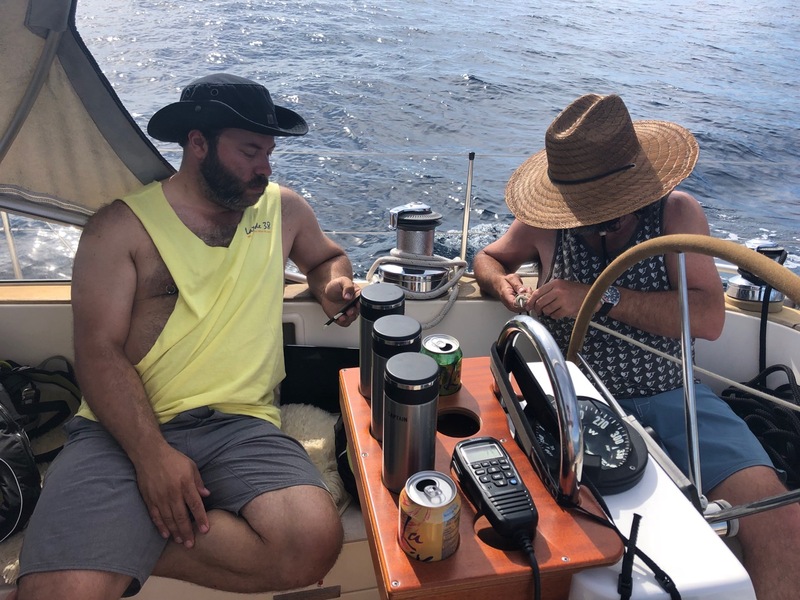 So we can swim in the sea, climb onto the back of the boat, and have a warm fresh water rinse, or we can climb out of the cockpit and stand on what I like to call our back porch and have a shower. but DANG was I going to have a shower. Just after I laid out my towel and toiletry bag in the cockpit, a fog rolled in and we were not only able to shower without giving the neighbors a breakfast floor show, but there was a flippin' FOGBOW. 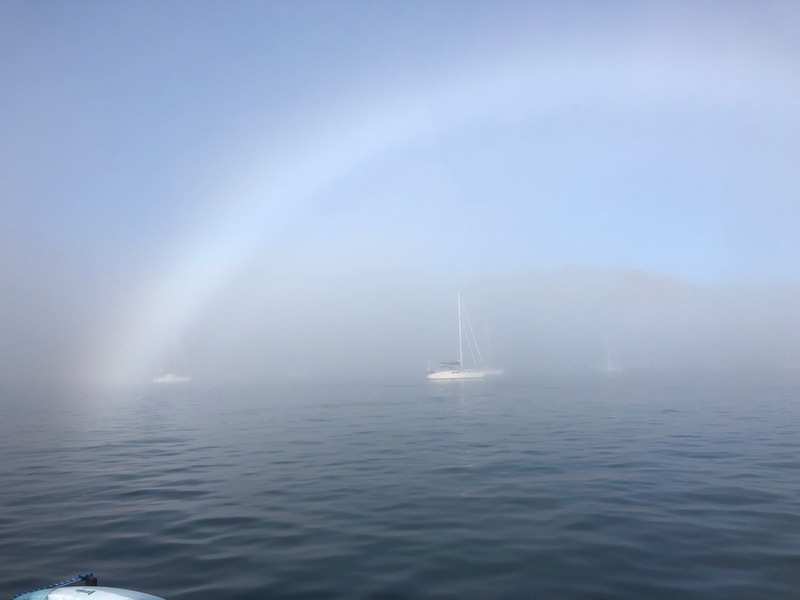 Did you know there are fogbows? 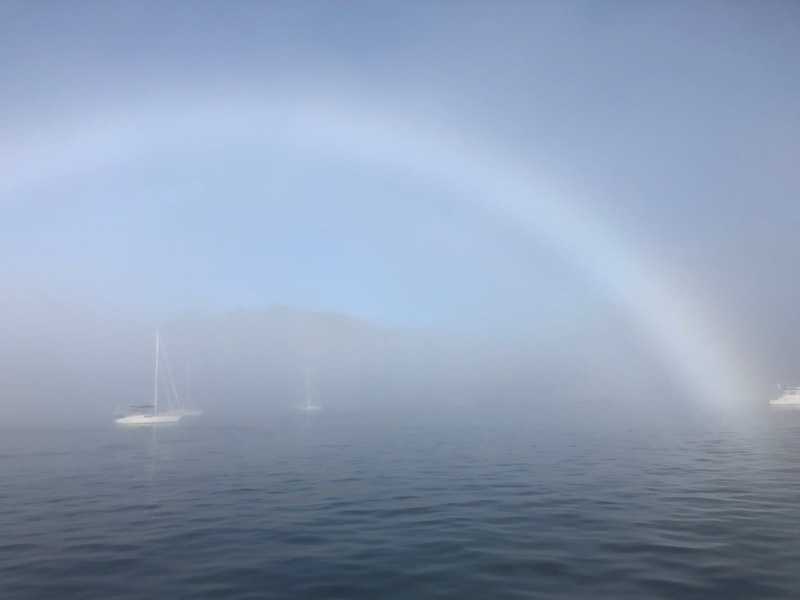 THERE ARE FOGBOWS. I know that what people like to see is people, but mostly, what I want to say is THE SKY THE SEA THIS PLANET. The clouds oppposite sunrise our second morning in the bay were like cotton candy! 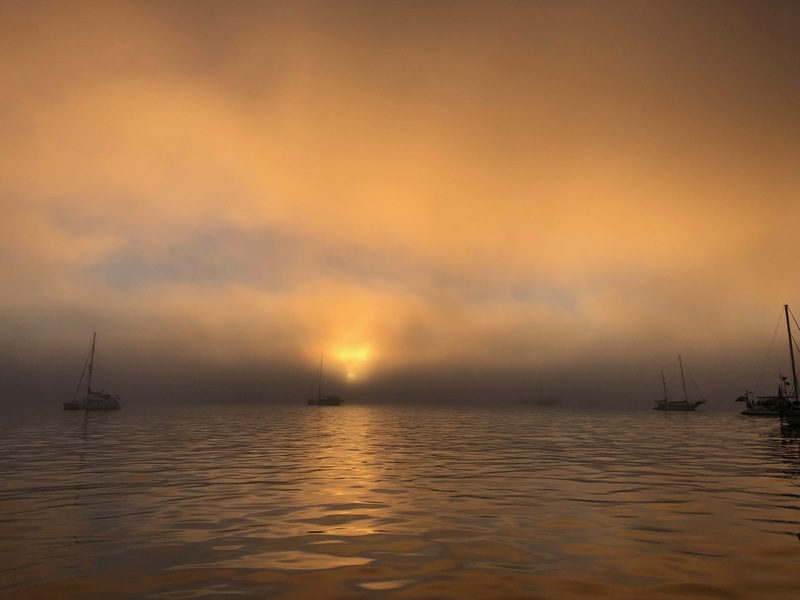 And then, just like the day before, as the sun came up the fog rolled in. There was a party onshore. This is NUTS. Bahia Santa Maria is populated by just a few small, simple fishermen's shacks. But each year for the Ha-Ha, their families drive in from nearby towns and throw a giant party. There is food for sale, which is a fundraiser for the local folks, and a band comes in from La Paz, and there is live music. Throughout the trip, folks gave generously of their skills. 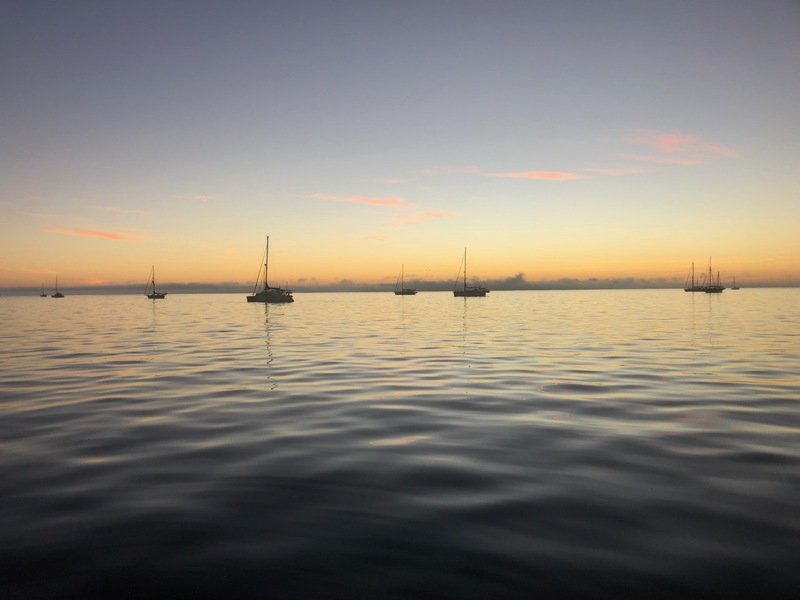 Mechanics helped fix boats, doctors offered medical advice. 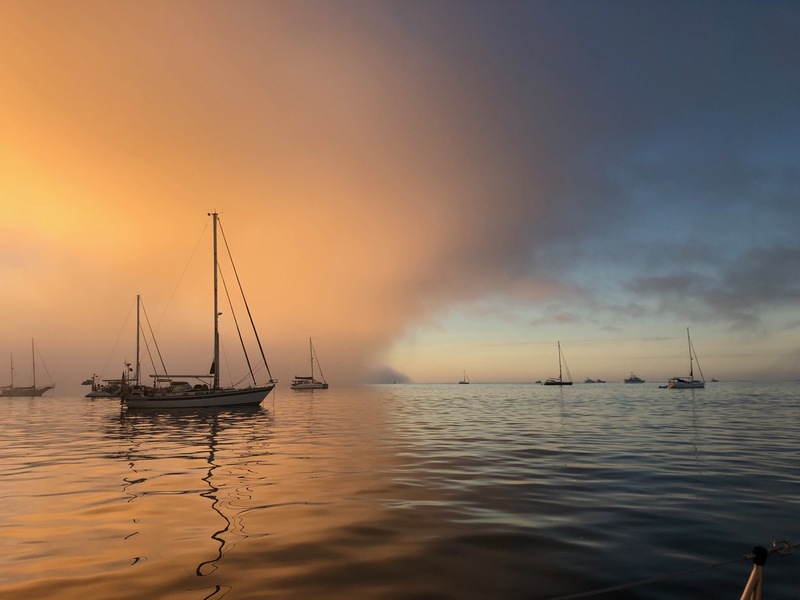 One boat got tangled in a fishing line after dark, fouling their propeller, and another boat towed them for eight hours to reach the anchorage so that they could anchor safely and dive to cut the lines off the propeller by daylight. 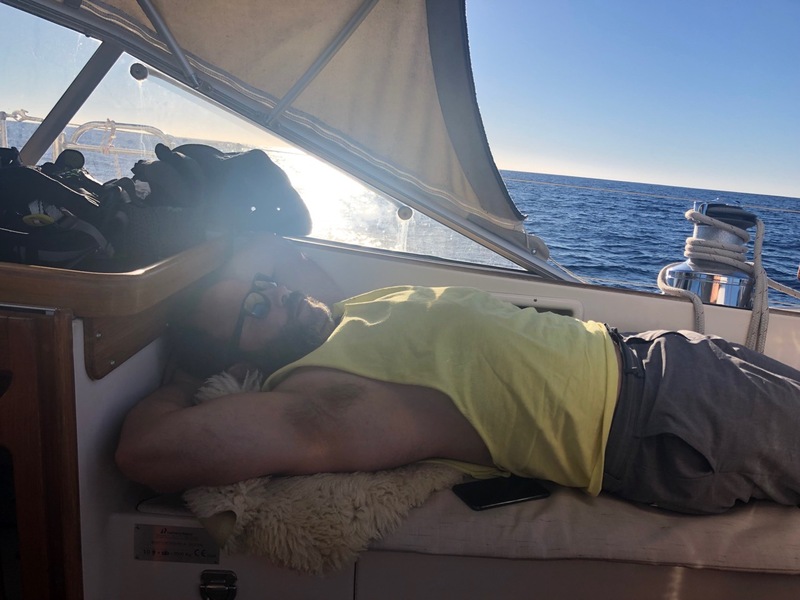 I suggested to a physical therapist on another boat that we offer some bodywork, and we both went into shore an hour before the party and hung out and offered neck and shoulder massage. It was super fun! I was too happy to photograph the party, but here's James, CLEAN and ready to head over. In Bahia Tortuga we inflated our dinghy and launched it. 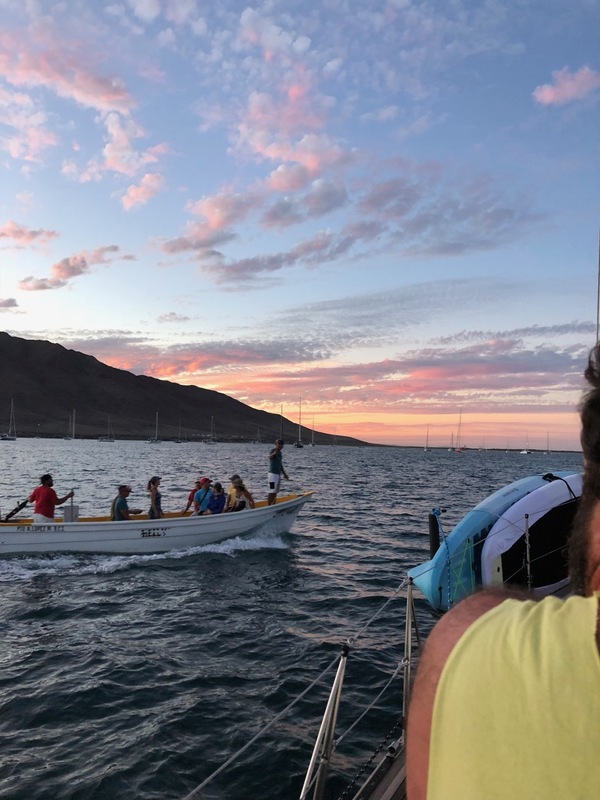 We carry the uninflated dinghy up onto the foredeck, inflate it, then use a halyard (a rope that runs from the top of the mast) to lift it with a winch so we can get it over the lifelines (the little fence that helps keep you on the boat) and down into the water. James was on the winch and I was steadying our tender/dinghy, Delight. 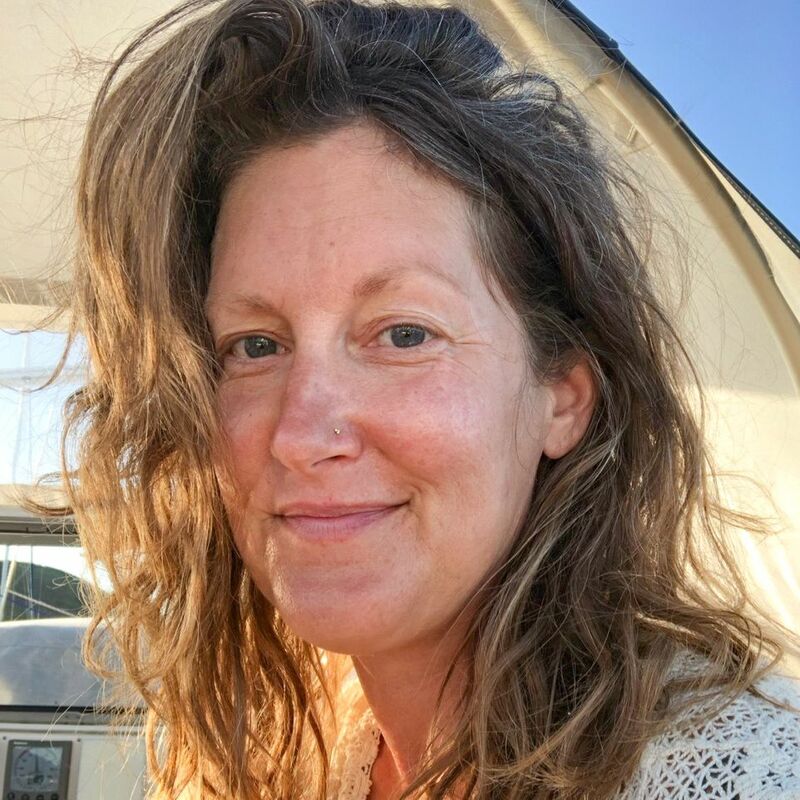 When she lifted off the deck, she became a kite, and the wind caught her; I staggered forward ONE STEP on the deck and kicked the base of one of the shrouds (the steel ropes that support our mast). It was the first time I'd stepped onto the deck barefoot the whole trip, and of course I broke my right middle toe. I had broken the toe beside it twice this spring, so the feeling was unmistakable. Never broke a toe in my life, and now three times in sixish months! It wasn't a bad break, and it is healing really nicely. In Bahia Santa Maria, James was working to adjust another part of the dinghy, which is the crane on the back of the boat that we use to lower the outboard motor down onto the dinghy or lift it up. 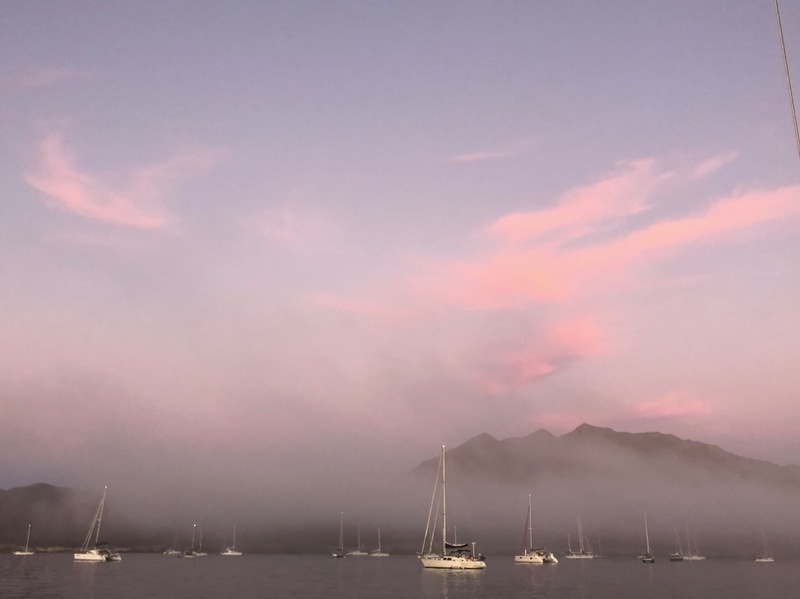 Someone was speaking to James from a dinghy in the water, and he glanced over for a moment and fumbled... and the support that he was adjusting slipped out of his hands and into the bay. He tried to dive for it, and a friend came by with an underwater drone the next day to look for it, but no luck. We took a panga to the party! Pangas are the boats the local fishermen use, and during the Ha-Ha, they do taxi service, taking folks from their boats to the shore. The party was great! We ended leg two once again happy and well, and excited for the final leg of our trip and our arrival in Cabo San Lucas.